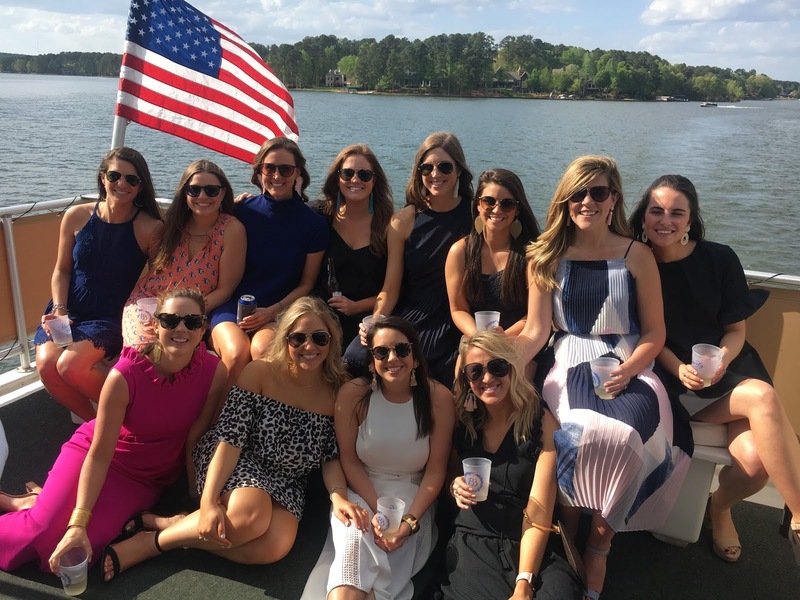 This past weekend we had THE best time at Beverly and Ben's wedding weekend at Lake Oconee. I don't know if I have ever seen two people more perfect for each other.. and the love that SO many people have for the two of them is just mind blowing. All. the. feels. All. weekend. We kicked the weekend off at Mr. Bev's lake house for a welcome party - BBQ, wine, and a breathtaking sunset. Sign me up. And then we checked into our villas and hung out at the little bar down the street. 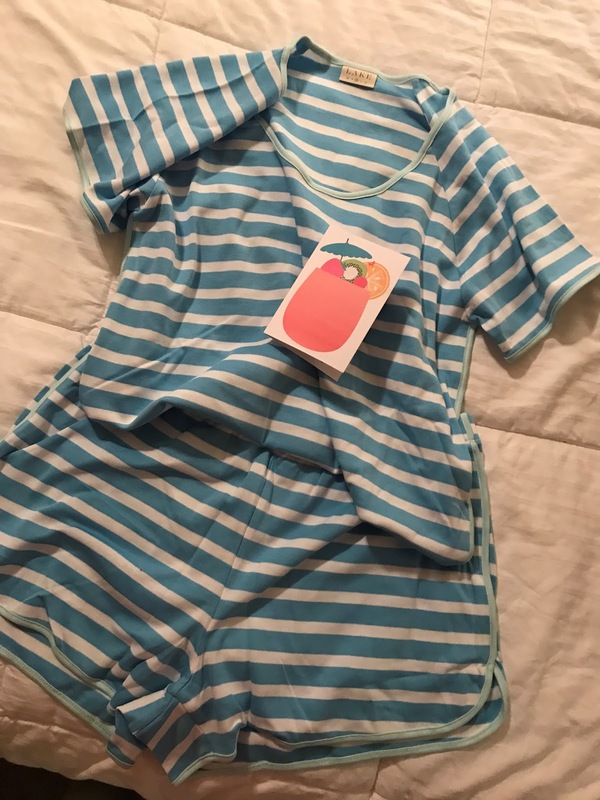 I got to our villa to find our bridesmaid gift from Beverly - Lake Pajamas!! I have wanted some of these so badly and could not for the life of me remember the name. I texted Bev about them and she conveniently ignored me, haha. SUCH a thoughtful (and appropriate) gift for our wedding weekend at the lake. The next morning I gloriously slept in as late as I wanted and then got ready for the bridesmaids' luncheon. The weekend was so well planned with everyone just being able to walk (like to the luncheon) or we had a shuttle to take us if it was further. White wine, chicken salad, and our earrings for the big day. Shout out to Kell Bell for letting me borrow this cutie dress. Beverly has THE sweetest sorority sisters that I have totally taken as my own friends. Us girls (and our significant others) had SO much fun all weekend long. 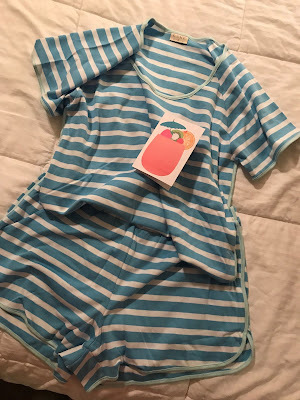 We had about an hour in between the luncheon and our next event, so I hopped in bed to rest (this is such a novelty these days), wrote my speech for the rehearsal dinner (oops), then changed outfits for the booze cruise. We went to the venue for the rehearsal, then hopped on this huge house boat for a booze cruise. The weather was absolutely perfect.. Bev and I texted almost daily about the weather leading up to this weekend. And I don't think she could have asked for anything more perfect. The size of the boat was so plentiful for all the friends and family to enjoy beer, wine, cheese and the lake. Next up was the rehearsal dinner. These guys... trouble. The rehearsal dinner food was AMAZING and the company was even better. I've been to a lot of weddings.. but the toasts given were just out of this world. So much love crammed in that little restaurant on the lake. After the rehearsal dinner, we had an oyster roast for all the out of town guests, THEN we went back to the villa for an after party. This Mama has not stayed out past midnight (much less two nights in a row) in a looonggg time. Needless to say, my make up appointment at 7:30 the next morning came EARLY. But all bridesmaids had hair and make up done, and completely dressed by 1pm for pictures. LOVE this friend of mine. She had every single detail of the wedding weekend planned perfectly. Not only did it look JUST like she wanted it to, but she ensured every single member of the wedding party, spouses and wedding guests had the best time. This sweet girl is the most thoughtful and selfless person I know - lucky to call you mine Bevvie!! And so thankful this guy had such a blast too. He fished, boated, hung out with new friends and took care of the best dog, Sand Man. Meanwhile.. this sweet girl had a BLAST at Gigi's house. We met Mom right off i20 to pick her up and she immediately fell fast asleep. We missed her so, so much, but she was in such good hands and that parents weekend sure refreshed our souls. We unpacked, washed clothes, bought groceries and got ready super fast for our favorite guy's birthday dinner! We had his dad, step mom, sister and her boyfriend over for steaks and the fixings. I also made my key lime cake that I make him every year and it miserably flopped this year... He was celebrated nonetheless! Feeling so thankful. Thankful to be home close to friends and family. Thankful for my mom being the best Gigi ever and helping out with our girl. Thankful for some time away with my husband. Thankful for an incredibly special friend and thankful she found her absolute perfect match. Thankful for new friends made along the way. And lastly SO thankful I got to spend another birthday with the most thoughtful, kindhearted, loving man in the world.. my husband. Alright, that was a lot of mush for one post. See you guys back here on Friday!! Wow, what a fun weekend. Love the bridesmaid dresses she chose.